di Massa” for ships and “Molo Beverello” for hydrofoils .There are several navigation companies. On summer time the departures to Ischia are made both by ships or hydrofoils every about 30 minutes during all the day. 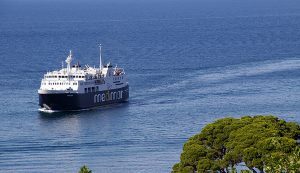 The differences between ferry and hydrofoil are the time to arrive to Ischia, less by hydrofoil (about 40 minutes to reach Ischia ) and the chance to embark the own vehicle only on the ship. Both the solutions offer a pleasure trip with confortable seats and conditioned air. On board there are shared areas and services like coffee bar, plays areas for babies and armchair areas. During the crossing it’s possible to have a wonderful view of Campania coast landscape. If you want to buy online your ticket to Ischia you can use the form below or send us an email to info@isclatravel.com. line ticket buy. If you want contact “Traghettilines.it” you can go on http://www.ok-ferry.com/ . The most simple way to reach Ischia by Naples is to use our private transfer service : an employee of our agency will come to pick you up at the Naples airport or at the train station. He will see you to the port and he will supply the tickets of ship or hydrofoil you need. Isclatravel offers a quality service and to receive an estimate you can send us an email to info@isclatravel.com with details of arrival date, place , time and the destination. More information about "Sea links from Naples to Ischia"?